Move over, Douglas Sirk: we've just seen a 'women's picture' that makes us forget all others. Japanese director Mikio Naruse's 1960 drama When a Woman Ascends the Stairs (Onna ga kaidan wo agaru toki) is simply a masterpiece, a superior story about life as it is lived in the Ginza district of small bars. Hideko Takamine's supervising hostess feels the economic pinch that gives ulcers to small business operators all over the world. Nobody seems to be on the side of an independent woman. Creditors, competitors and potential 'patrons' all want a piece of her life. Beautiful widow Keiko "Mama" Yashiro (Hideko Takamine) is a Ginza district bar hostess slipping into debt. She supervises several younger bar girls, whose job it is to entertain and serve businessmen in need of relaxation and support. Some of the girls, including the cute Junko Inchihashi (Reiko Dan of Red Beard) turn 'pro' and sleep with the customers, but Keiko has avoided becoming the mistress of any of the married industrialists that frequent her bar. They offer the financing Keiko needs to gain independence, but always with the price tag of sexual favors. Keiko is pressured to increase the popularity of her bar but can do nothing when ex-employee Yuri (Keiko Awaji) lures away her best clients. As a number of financial and emotional setbacks begin to wear her down, Keiko considers going the kept woman route. Through it all, bar manager Kenichi Komatsu (Tatsuya Nakadai) stays secretly in love with Keiko, convinced that she's above the venality around her. When a Woman Ascends the Stairs could also be titled 'when a woman goes into business.' This absorbing drama takes a character we would normally associate with film noir into the real world of the Ginza, where a hostess's fortune is measured in how many men she can attract to her bar. Keiko is not a prostitute, although many of her girls regularly sleep with clients for money. She's also not a Geisha; one client brings a painted, traditionally attired Geisha with him to her club. Keiko is a firm-minded woman trying to survive in a business climate cruelly slanted against women. The businessmen run up large bills for the illusion of being 'special' and the prestige of having beautiful women wait on them. They can withdraw their patronage at any time. Individual hostesses must decide how best to behave in a climate that encourages men to make passes. Keiko is convinced that being too easy isn't good policy. Besides the personal degradation, she feels that sleeping with a casual beau would lessen her attractiveness in the long run. Behind everything is the illusion of carefree prosperity. Even Keiko must spend on a fancy wardrobe and an attractive apartment to maintain a false front of success. Her clients play games of false humility, praising the success of others while talking poor and spending big. The nature of the job requires Keiko to be two-faced to all of them. Only Komatsu thinks he sees the real Keiko behind her placid guise as the respected Mama-san, the impeccable hostess devoted to her dead husband. Several of Keiko's high rollers have shifted their business to Yuri's new bar. Yuri looks successful but has run up enormous bills and is losing money. Keiko is advised to emulate Yuri's hip, modern attitude but resists changing from what works for her. She doesn't wear flashy kimonos or western dresses and isn't as flirtatious as her girls, who can come on as real gold diggers. Keiko's clients owe big bar tabs, but she doesn't hound them with phone calls as does Yuri; it's just not polite. If Keiko doesn't collect the money, she must pay it herself. In fact, when a competing hostess dies, heartless creditors immediately descend on her penniless family. At regular intervals Keiko treads the stairs to her club while we hear her voiceover narration. Behind her beautiful, calm face is a knot of anxieties. Her mother criticizes her lifestyle. Her brother plagues her for money to bail him out of legal scrapes and treatments for his polio-afflicted son. Wealthy admirers like the elderly Goda (Ganjiro Nakamura) dangle huge sums in front of Keiko, thinking they can buy her favors the same way they order drinks in her bar. Keiko is in love with one attractive businessman, Nobuhiko Fujisaki (Masayuki Mori). But he is married, and is no more sincere than her other suitors. Unlike her flashier competition, Keiko is discreet and observes impeccable manners. But those qualities don't seem to be appreciated. When the promiscuous Junko announces that she'll open her own bar, Keiko's congratulations have a bitter edge -- Junko has taken the 'sponsorship' arrangement with Goda that Keiko turned down. Keiko's efforts to obtain financing for her bar without becoming a kept woman come to naught -- all opportunities would compromise her integrity, and all of her stair-climbing seems to get her nowhere. Yet Keiko takes full responsibility for her life and would never consider herself a victim of the system. Making a living and observing a moral code seem to be mutually exclusive goals. The pressure on Ginza businesswomen is indicated right from the start, when we hear about a hostess who has killed herself. Keiko drinks too much, missing work and developing an ulcer. She accepts a marriage proposal from the apparently sweet and wealthy Matsukichi Sekine (Daisuke Katô), a decision that begins Keiko's downfall. It's the tailspin of a woman under too much pressure, who unwinds far too suddenly. Mikio Naruse's excellent direction mixes studio sets with location work, and he gets great performances from the Toho acting pool. Daisuke Katô, one of the original Seven Samurai, is exceptionally good, along with the relative newcomer Tatsuya Nakadai. Although not credited, Akiko Wakabayashi (Dogora, You Only Live Twice) can be spotted as a bar hostess. But the film belongs to Hideko Takamine. She puts her performance into her eyes, and we care deeply what happens to her. Near the end of the show Naruse stages a devastating confrontation between Keiko and an overworked mother. Keiko stands in a dirty yard while two kids ride a tricycle in circles around her. The potent image makes the coded social criticism of American 'women's films' seem petty. 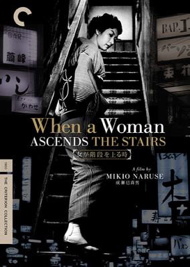 Criterion's DVD of When a Woman Ascends the Stairs is presented in a fine enhanced B&W transfer. A few shots exhibit some density mottling, but otherwise the visuals are pristine. Masao Tamai's sleek Tohoscope camerawork matches composer Toshirô Mayuzumi's xylophone-driven jazz score, creating a clean, modern feel. The laid-back title sequence is particularly good. Donald Ritchie contributes a full-length commentary, arguing for director Naruse as the unheralded equal of Japanese greats Mizoguchi and Ozu. Actor Tatsuya Nakadai, now sporting a white beard, is present to discuss the experience of filming the movie with director Naruse and his fascinating co-star. An insert booklet presents essays by Philip Lopate, Catherine Russell and Audie Bock, offering slightly different takes on the problem faced by Keiko the club hostess. Is she in control of her fate, or is she just a pawn? Actress Hideko Takamine is present with a 1984 piece remembering Naruse. A trailer is also included. The disc producer is Kim Hendrickson. Supplements: Commentary by Donald Ritchie, interview with Tatsuya Nakadai, liner insert essays by Philip Lopate, Catherine Russell, Audie Bock and actress Hideko Takamine.